Autosomal dominant polycystic kidney disease (ADPKD) is characterized by innumerous fluid-filled cysts and progressive deterioration of renal function. Previously, we showed that periostin, a matricellular protein involved in tissue repair, is markedly overexpressed by cyst epithelial cells. 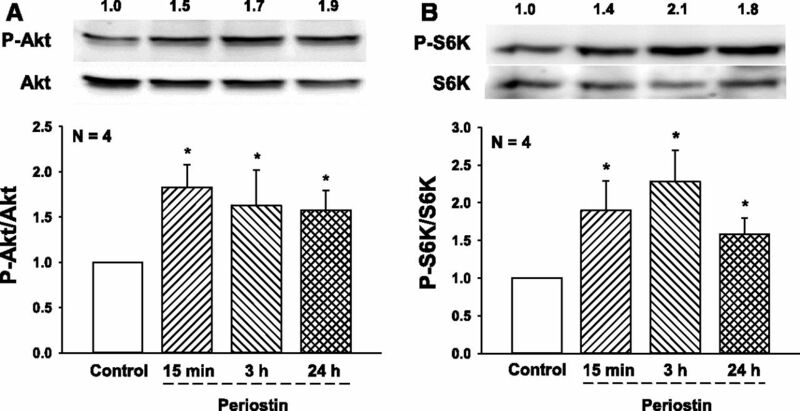 Periostin promotes cell proliferation, cyst growth, interstitial fibrosis, and the decline in renal function in PKD mice. Here, we investigated the regulation of these processes by the integrin-linked kinase (ILK), a scaffold protein that links the extracellular matrix to the actin cytoskeleton and is stimulated by periostin. 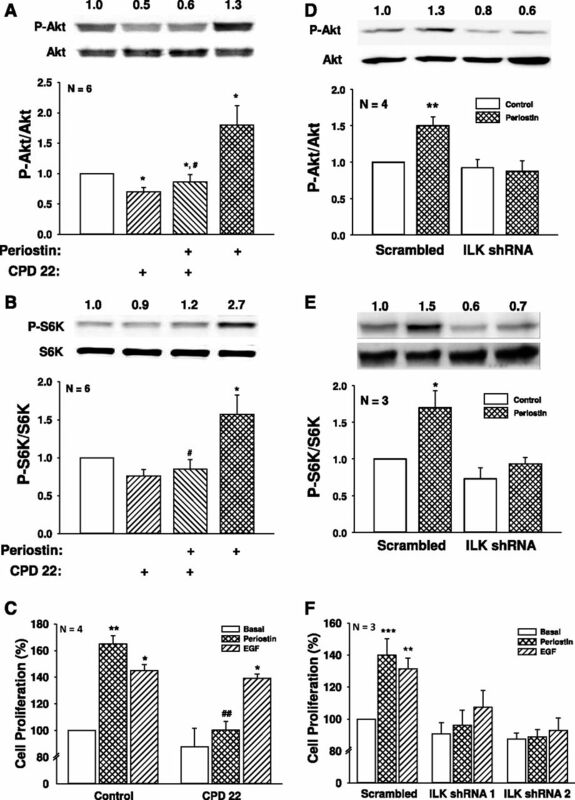 Pharmacologic inhibition or shRNA knockdown of ILK prevented periostin-induced Akt/mammalian target of rapamycin (mTOR) signaling and ADPKD cell proliferation in vitro. Homozygous deletion of ILK in renal collecting ducts (CD) of Ilkfl/fl;Pkhd1-Cre mice caused tubule dilations, apoptosis, fibrosis, and organ failure by 10 weeks of age. By contrast, Ilkfl/+;Pkhd1-Cre mice had normal renal morphology and function and survived >1 year. Reduced expression of ILK in Pkd1fl/fl;Pkhd1-Cre mice, a rapidly progressive model of ADPKD, decreased renal Akt/mTOR activity, cell proliferation, cyst growth, and interstitial fibrosis, and significantly improved renal function and animal survival. Additionally, CD-specific knockdown of ILK strikingly reduced renal cystic disease and fibrosis and extended the life of pcy/pcy mice, a slowly progressive PKD model. We conclude that ILK is critical for maintaining the CD epithelium and renal function and is a key intermediate for periostin activation of signaling pathways involved in cyst growth and fibrosis in PKD. Autosomal dominant polycystic kidney disease (ADPKD) is caused by mutations in PKD1 or PKD2, which encode for polycystin-1 and -2, respectively.1 The disorder is characterized by the formation of fluid-filled cysts, leading to loss of functional parenchyma, interstitial fibrosis, and enlarged kidneys. Several signaling pathways have been implicated in polycystic kidney disease (PKD)2; however, the mechanisms involved in disease progression remain unclear. Cyst-lining cells are characterized as being incompletely differentiated and express factors involved in tissue repair.3–5 As cysts expand, compression of neighboring nephrons also induces an injury response that activates repair mechanisms, including the Akt/mammalian target of rapamycin (mTOR) pathway.4,6,7 This perpetual renal injury-repair response contributes importantly to aberrant cell proliferation5,8 and relentless cyst growth. We determined if ILK mediates periostin-induced ADPKD cell proliferation and if knocking down ILK in renal collecting ducts (CDs) reduces cystic disease in two models of PKD. The results indicate that ILK is a key intermediate in the activation of cellular pathways involved in cyst growth. We propose that targeting the periostin-integrin-ILK axis may be a potential therapeutic approach to slow cyst growth and fibrosis in PKD. ILK was immunoprecipitated from primary ADPKD and normal human kidney (NHK) cells and incubated with GSKα/β protein or myelin basic protein in a kinase assay.25,46 Consistent with previous reports, ILK appeared to be capable of phosphorylating these substrates (Supplemental Figure 1); however, it is unclear if other components of the complex were immunoprecipitated with ILK.29,33,36 Basal ILK activity was higher in ADPKD than NHK cells and periostin caused a further increase in ILK activity in ADPKD cells. Previously, we found that periostin stimulated the proliferation of ADPKD cells, but not NHK cells, a difference that may be related to increased expression of αV-integrin in the cystic cells.19 Periostin increased phosphorylated Akt (P-Akt/Akt) and S6K (P-S6K/S6K), a target of mTOR, in as little as 15 minutes and levels remained elevated for 24 hours (Figure 1). Incubation with CPD 22, an ILK inhibitor,47 blocked periostin-induced phosphorylation of Akt and S6K (Figure 2, A and B). Periostin and EGF increased ADPKD cell proliferation to similar levels. 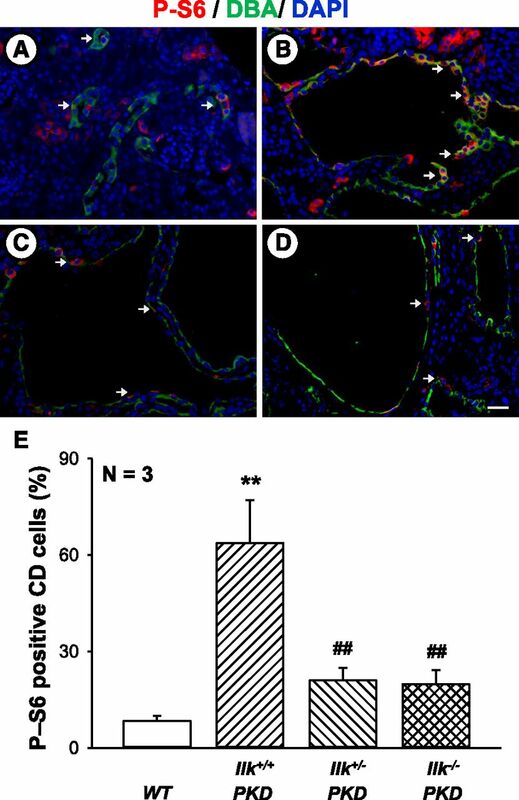 Incubation with CPD 22 blocked periostin-induced cell proliferation (Figure 2C) but did not affect the EGF response. Periostin stimulates the Akt/mTOR pathway in human ADPKD cells. Primary cyst epithelial cells from human ADPKD kidneys (n=4) were incubated in media containing 250 ng/ml periostin for 15 minutes, or 3 or 24 hours. Levels of (A) phosphorylated Akt (P-Akt) and (B) phosphorylated S6K (P-S6K), a downstream target of mTOR, were determined by immunoblot analysis. Numbers above representative immunoblots are (A) P-Akt/Akt and (B) P-S6K/S6K, normalized to control (set to 1.0). Bar graphs represent the mean and SEM for (A) P-Akt/Akt and (B) P-S6K/S6K from cell preparations from four different ADPKD kidneys. *P<0.05, versus control treatment. ILK inhibition or knockdown prevents periostin-induced Akt/mTOR signaling and ADPKD cell proliferation. ADPKD cells were treated with or without 2.5 µM CPD 22 for 1 hour and then periostin was added for an additional 15 minutes. Immunoblot analysis was used to measure (A) P-Akt/Akt and (B) P-S6K/S6K. (C) The effect of ILK inhibition on ADPKD cell proliferation was determined by treating cells with 250 ng/ml periostin or 25 ng/ml EGF for 48 hours in the presence or absence of 1 µM CPD 22. Cell numbers were counted using a BioRad TC20 cell counter. To confirm the role of ILK, ADPKD cells were infected with lentivirus containing shRNA against ILK or a nonspecific (scrambled) sequence. Cells were treated with 250 ng/ml periostin for 15 minutes and levels of (D) P-Akt and (E) P-S6K were measured by immunoblot analysis. Summary data for (D) P-Akt/Akt and (E) P-S6K/S6K were normalized to basal conditions of scrambled shRNA cells (set to 1.0). (F) ADPKD cells were infected with an ILK (shRNA 1 or shRNA 2) or a scrambled shRNA lentivirus, and then treated with periostin or 100 ng/ml EGF for 24 hours. Cell proliferation was measured by Promega MTT assay and normalized to basal proliferation of cells infected with the scrambled shRNA (set to 100%). Cell proliferation was also confirmed by counting cell numbers (Supplemental Figure 2, B and C). *P<0.05, **P<0.01, and ***P<0.001, compared with control or basal conditions of scrambled shRNA infected cells, and #P<0.05, ##P<0.01, compared with periostin alone. Ilkfl/fl mice50 were crossed with Pkhd1-Cre mice51 to generate wild-type (WT: Ilk+/+ CD), Ilkfl/+;Pkhd1-Cre (Ilk+/− CD), and Ilkfl/fl;Pkhd1-Cre (Ilk−/− CD) mice. ILK deletion in CDs was confirmed by coimmunofluorescence using an ILK antibody and Dolichos biflorus agglutinin (DBA, green) (Figure 3). Ilk−/− CD mice had lower body weight and developed a urine concentrating defect (Supplemental Table 1), consistent with a previous report.52 Kidneys of Ilk−/− CD mice had caspase-3–mediated anoikis53 with apoptotic cells in the lumen and dilated cortical tubules (Supplemental Figure 3). There was a significant increase in BUN as early as 25 days. By 10 weeks of age, Ilk−/− CD mice had reduced kidney size (Supplemental Table 1), massive levels of apoptosis, and renal fibrosis (data not shown), and the mice died by 10.4±0.34 weeks (n=14). By contrast, Ilk+/− CD mice had normal renal morphology and function, urine osmolality, and body weight, and survived beyond 1 year. CD-specific ILK knockout in mice. At PN day 25, Ilk+/+;Pkhd1-Cre (Ilk+/+ CD) and Ilkfl/fl;Pkhd1-Cre (Ilk−/− CD) mice were euthanized, and kidney sections were stained for ILK (red), DBA (green), and DAPI nuclear stain (blue). Left panels (A and C) are images of kidney sections that were stained for ILK expression (red). Right panels (B and D) are merged images in which ILK, DBA, and DAPI staining was superimposed. Top panels (A and B) show an Ilk+/+ CD mouse kidney section with normal ILK expression in a CD (arrow). Bottom panels (C and D) show that Ilk−/− CD mouse kidney sections lack ILK expression in the CDs. Scale bar=5 µm. ILK expression was knocked down in CDs of Pkd1fl/fl;Pkhd1-Cre (PKD) mice, an orthologous ADPKD model with aggressive disease.51 These mice typically die by 33 days with massively enlarged kidneys. We generated Ilk+/+;Pkd1fl/fl;Pkhd1-Cre (Ilk+/+ PKD), Ilkfl/+;Pkd1fl/fl;Pkhd1-Cre (Ilk+/−PKD), and Ilkfl/fl;Pkd1fl/fl;Pkhd1-Cre (Ilk−/− PKD) mice (Figure 4). 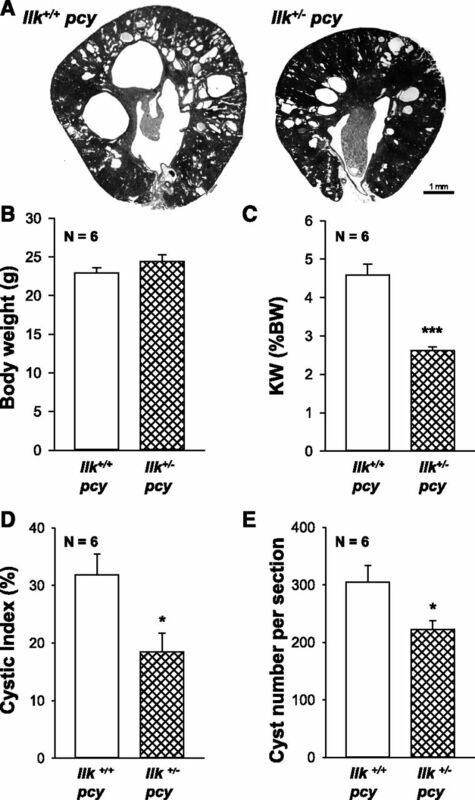 By 25 days, the PKD mice had massively enlarged kidneys (Figure 4, A and B) with percent kidney weight to body weight equaling 18.0% (Figure 4D), compared with 1.3% for WT mice (Supplemental Table 1). Loss of one or both alleles of ILK reduced kidney weight (% body weight) to 12.7% or 5.1%, respectively (Figure 4D). There was no difference in body weight among the three genotypes (Figure 4C). Cystic area of the kidneys was reduced from 55% in Ilk+/+ PKD mice to 43% and 28% in Ilk+/− PKD and Ilk−/− PKD mice, respectively (Figure 4, B and E). There were also fewer cysts in Ilk+/− PKD and Ilk−/− PKD kidneys; however, this difference was NS (data not shown). ILK knockdown decreases cyst growth and kidney weight in PKD mice. Representative images of (A) kidneys and (B) kidney sections from Ilk+/+;Pkd1fl/fl;Pkhd1-Cre (Ilk+/+ PKD), Ilkfl/+;Pkd1fl/fl;Pkhd1-Cre (Ilk+/−PKD), Ilkfl/fl;Pkd1fl/fl;Pkhd1-Cre (Ilk−/− PKD), and WT mice demonstrate that the loss of ILK expression in CD cells reduced cyst growth in PKD mice. All images were taken at the same magnification. Scale bar=1 mm. Bar graphs are mean±SEM for (C) Body weight and (D) kidney weight as a percentage of body weight (% body weight) for n=10 mice per group. (E) Cystic index is represented as the percentage of cystic area per total kidney cross-sectional surface area for n=7 mice per group. **P<0.01 and ***P<0.001, compared with Ilk+/+ PKD mice. To determine if CD-specific knockdown of ILK decreased cell proliferation, the number of Ki-67–positive cells in DBA-positive tubules was determined using immunofluorescence (Figure 5). We found that Ki-67–positive cells were dramatically decreased with the loss of one or both alleles of ILK in CD cells (Figure 5E). ILK knockdown reduces renal cell proliferation in PKD mice. Representative kidney sections from (A) WT, (B) Ilk+/+;Pkd1fl/fl;Pkhd1-Cre (Ilk+/+ PKD), (C) Ilkfl/+;Pkd1fl/fl;Pkhd1-Cre (Ilk+/−PKD), and (D) Ilkfl/fl;Pkd1fl/fl;Pkhd1-Cre (Ilk−/− PKD) mice were stained with an antibody to Ki-67, a marker for cell proliferation (red). Tissues were also stained for DBA (green) to detect CDs and the DAPI nuclear stain (blue). Arrows indicate Ki-67–positive CD cells. All images were taken at the same magnification. Scale bar=5 µm. (E) Summary data for the number of cells positive for nuclear Ki-67, normalized to the total nuclei in DBA-positive CDs. Data are mean±SEM for kidneys from three mice per group. **P<0.01 compared with WT, #P<0.05 and ##P<0.01 compared with Ilk+/+ PKD. Pkd1fl/fl;Pkhd1-Cre kidneys had higher P-Akt/Akt levels than WT kidneys6,54 and partial loss or complete ablation of ILK reduced P-Akt/Akt (Supplemental Figure 4, A and B). Percentage of CD cells with phosphorylated S6 (P-S6) was higher in Ilk+/+ PKD compared with WT mice, and partial or complete loss of ILK significantly diminished P-S6 in CD-derived cysts (Figure 6). These data support the hypothesis that ILK is a key regulator of Akt/mTOR signaling in PKD. ILK knockdown decreases mTOR signaling in PKD kidneys. Representative sections from (A) WT, (B) Ilk+/+;Pkd1fl/fl;Pkhd1-Cre (Ilk+/+ PKD), (C) Ilkfl/+;Pkd1fl/fl;Pkhd1-Cre (Ilk+/−PKD), and (D) Ilkfl/fl;Pkd1fl/fl;Pkhd1-Cre (Ilk−/− PKD) mice were stained with an antibody to P-S6 (red). Tissues were also stained for DBA (green) to detect CD and the DAPI nuclear stain (blue). Arrows indicate cytoplasmic P-S6 in CD cells. All images were taken at the same magnification. Scale bar=5 µm. (E) Percentage of cytosolic P-S6–positive cells, normalized to the total nuclei in DBA-positive CDs. Data are mean±SEM for kidneys from three mice per group. **P<0.01 compared with WT, ##P<0.01 compared with Ilk+/+ PKD. ILK ablation induces caspase-3-mediated apoptosis in PKD kidneys. Representative kidney sections from (A) WT, (B) Ilk+/+;Pkd1fl/fl;Pkhd1-Cre (Ilk+/+ PKD), (C) Ilkfl/+;Pkd1fl/fl;Pkhd1-Cre (Ilk+/−PKD), and (D) Ilkfl/fl;Pkd1fl/fl;Pkhd1-Cre (Ilk−/− PKD) mice were stained with an antibody to cleaved caspase-3 to visualize apoptotic cells (brown staining). All images were taken at the same magnification. Scale bar=50 µm. (E) Total number of cleaved caspase-3–positive cells in the entire section was counted and normalized to the noncystic surface area of the kidney (represented as percentage cleaved caspase). Data are means±SEM for kidneys from three mice per group. *P<0.05 compared with WT, ###P<0.001 compared with Ilk+/+ PKD. Pkd1fl/fl;Pkhd1-Cre mice develop extensive interstitial damage involving fibrosis and edema, a precursor for collagen deposition and fibrosis. At postnatal (PN) day 25, there was massive fibrosis/edema in Ilk+/+ PKD kidneys with 91% of the interstitial space showing pathologic damage (Figure 8). Ilk+/+ PKD mice showed a marked increase in BUN (132.8±7.7 mg/dl; normal range is 8–33 mg/dl). Loss of one or both alleles of ILK in CD cells caused a reduction in fibrosis. Decreased expression of ILK in Ilk+/−PKD mice reduced BUN levels, compared with Ilk+/+ PKD mice. By contrast, BUN levels of Ilk−/− PKD mice were similar to Ilk+/+ PKD mice, suggesting that renal injury due to loss of ILK confounds the improved cystic phenotype in these mice. ILK knockdown reduces renal interstitial fibrosis and improves kidney function in PKD mice. Representative kidney sections from (A) WT, (B) Ilk+/+;Pkd1fl/fl;Pkhd1-Cre (Ilk+/+ PKD), (C) Ilkfl/+;Pkd1fl/fl;Pkhd1-Cre (Ilk+/−PKD), and (D) Ilkfl/fl;Pkd1fl/fl;Pkhd1-Cre (Ilk−/− PKD) mice were stained with Masson trichrome to visualize pathogenic collagen deposition (stained blue). All images were taken at the same magnification. Scale bar=50 µm. (E) Tissue sections were coded to conceal the group assignment before being visually scored for percentage of interstitial fibrosis and edema per total area of the tissue section. Data are means±SEM for kidneys from seven mice per group. (F) Serum was isolated from WT (n=5), Ilk+/+ PKD (n=10), Ilk+/− PKD (n=10), and Ilk−/− PKD (n=7) and BUN was determined to assess renal function. ***P<0.001 compared with WT, #P<0.05 compared with Ilk+/+ PKD. Next, we determined if knockdown of ILK alters the lifespan of the PKD mice. Pkd1fl/fl;Pkhd1-Cre mice expressing normal ILK lived to approximately 33 days (Figure 9). PKD mice heterozygous at the ILK locus (Ilk+/− PKD) survived to 42 days, displaying a 27% increase in lifespan. Complete ILK knockout increased survival to 40 days; however, this was NS. These data indicate that a reduction in ILK decreased cyst growth by inhibiting mitogenic pathways, leading to improved renal function and survival. By contrast, complete loss of ILK induced cell death, contributing, in part, to the decrease in cyst burden. ILK knockdown increases the survival of PKD mice. (A) Kaplan–Meier survival curve for Ilk+/+;Pkd1fl/fl;Pkhd1-Cre (Ilk+/+ PKD, n=11), Ilkfl/+;Pkd1fl/fl;Pkhd1-Cre (Ilk+/−PKD, n=13), and Ilkfl/fl;Pkd1fl/fl;Pkhd1-Cre (Ilk−/− PKD, n=8) mice. The dotted line represents the time point at which 50% of the mice had died. ILK knockdown in CD cells extended the survival of PKD mice. 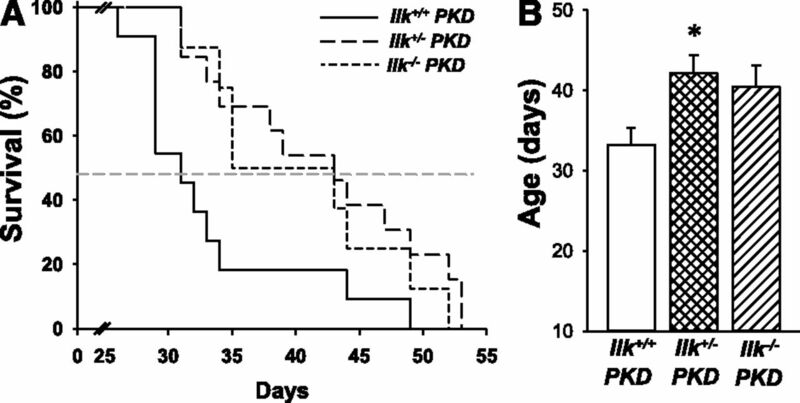 (B) Heterozygous loss of ILK significantly increased mean survival age from 33±2 for the Ilk+/+ PKD mice to 42±2 days for the Ilk+/− PKD mice, *P<0.05. Complete loss of ILK (Ilk−/− PKD) appeared to extend survival; however, the difference did not reach statistical significance. Next, we examined the role of ILK in pcy/pcy (pcy) mice, a well characterized slowly progressive model of PKD.58,59 We crossed Ilk fl/+ and Pkhd1-Cre mice to pcy mice to generate Ilk+/+;pcy/pcy (Ilk+/+ pcy) and Ilkfl/+;Pkhd1-Cre;pcy/pcy (Ilk+/− pcy) mice. Male Ilk+/+ pcy and Ilk+/− pcy mice were euthanized at 10 weeks, and body weight, kidney weight (% body weight), cystic index, and fibrosis were measured (Figure 10). We found that Ilk+/− pcy mice had a pronounced reduction in kidney weight (% body weight), with no effect on body weight. There was a pronounced reduction in cystic area and cyst number compared with Ilk+/+ pcy mice. mTOR signaling is elevated in pcy kidneys60 and reduced ILK expression downregulated both P-S6K and total S6K (Supplemental Figure 5). Measurement of Ki-67–positive cells showed a 59% reduction in proliferating cells in the Ilk+/− pcy kidneys (Figure 11, A–E). 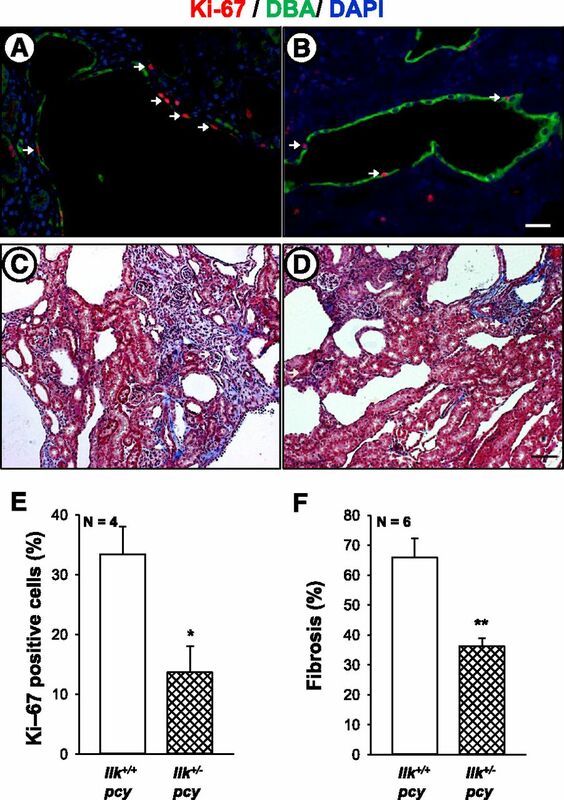 There was prominent interstitial fibrosis in pcy mice, and reduced ILK decreased fibrotic area by >50% (Figure 11F). We found that the average BUN for Ilk+/+ pcy mice at 25 weeks was 57.4 mg/dl, demonstrating a decline in renal function (Figure 12A). These mice lived to an average age of 40 weeks (Figure 12B).20 By comparison, BUN for Ilk+/− pcy littermates was significantly lower (42.0 mg/dl) and the mice survived to 48 weeks, indicating a 20% increase in lifespan. Taken together, these data demonstrate that ILK plays an important role in renal cyst growth and fibrosis in PKD. ILK knockdown attenuates renal cyst development in pcy mice. (A) Representative images of kidney cross-sections of Ilk+/+;pcy/pcy (Ilk+/+ pcy) and Ilkfl/+;Pkhd1-Cre;pcy/pcy (Ilk+/− pcy) mice at 10 weeks of age. Images were taken at the same magnification. Scale bar=1 mm. (B) Heterozygous loss of ILK in CD cells had no effect on body weight. However, there was a dramatic reduction in (C) kidney weight (% body weight), (D) cystic index, and (E) cyst number per section in Ilk+/−pcy mice compared with Ilk+/+ pcy mice. *P<0.05, ***P<0.001 compared with Ilk+/+ pcy mice. ILK knockdown reduces renal cell proliferation and fibrosis in pcy mice. Proliferating cells were determined in kidney sections from (A) Ilk+/+;pcy/pcy (Ilk+/+ pcy) and (B) Ilkfl/+;Pkhd1-Cre;pcy/pcy (Ilk+/− pcy) mice that were stained for Ki-67 (red), DBA (green), and DAPI (blue). Arrows indicate Ki-67–positive cells. Images (A and B) were taken at the same magnification. Scale bar=5 µm. Representative kidney sections from (C) Ilk+/+ pcy and (D) Ilk+/− pcy mice were stained with Masson trichrome to visualize interstitial fibrosis. Scale bar=50 µm. (E) Comparison of nuclear Ki-67 staining in Ilk+/+ pcy and Ilk+/− pcy sections, normalized to total nuclei. (F) Tissue sections stained with Masson trichrome were coded to conceal the group assignment and visually scored for percentage of interstitial edema and fibrosis. *P<0.05 and **P<0.01, compared with Ilk+/+ pcy. ILK knockdown improves renal function and increases the survival of pcy mice. Ilk+/+;pcy/pcy (Ilk+/+ pcy) and Ilkfl/+;Pkhd1-Cre;pcy/pcy (Ilk+/− pcy) mice were given standard chow and water ad libitum and monitored regularly until moribund. (A) At 25 weeks, blood was collected from the tail vein and BUN was measured to assess renal function (n=12 mice per group). **P<0.01, compared with Ilk+/+ pcy. (B) Kaplan–Meier survival curve indicates that heterozygous loss of ILK significantly increased the average lifespan of the pcy mice (n=14 mice per group). Average survival age increased from 40±2 weeks for the Ilk+/+ pcy mice to 48±2 weeks for the Ilk+/− pcy mice, P<0.001. Our results demonstrate that (1) ILK is a central intermediate for periostin activation of the Akt/mTOR pathway and proliferation of human ADPKD cells; (2) pharmacologic inhibition of ILK blocked periostin-induced Akt/mTOR signaling and cell proliferation; (3) heterozygous knockdown of ILK in CDs of WT mice had no effect on renal morphology or function, whereas complete ILK knockout caused caspase-3–mediated anoikis, dilated cortical tubules with apoptotic cells in the lumens, interstitial fibrosis, and death of the mice by 10 weeks of age; (4) reduced ILK expression in Pkd1fl/fl;Pkhd1-Cre and pcy/pcy mice decreased renal Akt/mTOR activity, cell proliferation, cyst growth, and interstitial fibrosis, and significantly extended the survival of PKD mice; and (5) homozygous deletion of ILK in the CDs of Pkd1fl/fl;Pkhd1-Cre mice decreased cystic index, in part, due to apoptosis of the cystic cells. ECM and matricellular proteins regulate gene expression by integrin signaling through ILK, which has been shown to be necessary for embryonic development of the kidneys. Deletion of ILK in the ureteric bud of Ilkfl/fl;HoxB7-Cre mice caused tubule obstruction, and the mice died at 8 weeks of age.39 Conditional knockout of ILK using a tamoxifen-inducible Cre caused a urinary concentrating defect which the authors attribute to a disruption of AQP2 expression and localization; however, morphologic changes in the kidneys were not reported.52 Here, we show that PN ablation of ILK in CDs caused a urinary concentrating defect and a decline in body weight and the mice died by 10 weeks of age. Loss of ILK caused anoikis and tubule dilations in the kidneys. Thus, complete knockout of ILK appeared to disrupt the connection between the ECM and cell cytoskeleton, leading to detachment of CD cells into the lumen and tubule obstruction. Pkd1fl/fl;Pkhd1-Cre mice die at approximately 33 days of age due to renal failure. Complete knockout of ILK caused apoptosis of the cystic epithelial cells, contributing to a reduction in the cyst area and size of the cystic kidneys. Mice with heterozygous knockout of ILK in CDs had normal kidneys, urinary concentrating ability, and BUN, and lived beyond 1 year. Importantly, reduction in ILK expression in the Pkd1fl/fl;Pkhd1-Cre mice and pcy mice decreased Akt/mTOR signaling, cell proliferation, cyst number, cystic index, and fibrosis. There was improved renal function and increased lifespan of the PKD mice. Previously, a small-molecule ILK inhibitor was shown to reduce renal fibrosis in a model of obstructive nephropathy,68 suggesting that ILK inhibition may be an effective approach for the treatment of ADPKD. Because complete knockout of ILK in CD cells caused renal injury, long-term use of an ILK inhibitor would need to be considered with caution. In summary, aberrant secretion of periostin by cystic epithelial cells contributes to a maladaptive repair process that activates the ILK-Akt-mTOR pathway, promoting cyst growth and fibrosis. We propose that targeting the periostin-integrin-ILK axis may be a potential therapeutic approach to slow cyst growth and fibrosis in PKD. Primary cultures of ADPKD and NHK cells were generated by the PKD Biomaterials and Biomarkers Core in the Kansas PKD Center at the Kansas University Medical Center (KUMC). ADPKD kidneys were obtained from the surgery department at KU hospital and other hospitals participating in the Polycystic Kidney Research Retrieval Program through the assistance of the PKD Foundation. NHKs, unsuitable for transplantation, were obtained from the Midwest Transplant Network (Kansas City, KS), an organ retrieval agency. The protocol for the use of discarded human tissues for research complies with federal regulations and was approved by the Institutional Review Board at KUMC. Primary cell cultures were prepared as described previously.69,70 Cells were propagated in DMEM/F12 supplemented with 5% FBS, 5 µg/ml insulin, 5 µg/ml transferrin, and 5 ng/ml sodium selenite (ITS) and penicillin G and streptomycin (P/S). After cells had reached 70%–80% confluence in the flasks, they were lifted from the plastic with a trypsin-EDTA solution (Sigma Chemical, Saint Louis, MO) and counted using a hemocytometer. ADPKD cells (7.5 × 104) were seeded into individual wells of six-well plates containing DMEM/F12, ITS, 1% FBS, and P/S. After cells reached approximately 50% confluence, the serum was reduced to 0.002%. After 24 hours, cells were treated with 250 ng/ml human recombinant periostin (75 kD; Biovendor, Asheville, NC) or 100 ng/ml EGF (Sigma Chemical) alone or in the presence of 1 μM CPD 22 (EMD Millipore, Billerica, MA), an ILK inhibitor,47 for an additional 24 hours. Each treatment was performed in triplicate. Cells were harvested by trypsinization, counted using an automated cell counter (Bio-Rad, Hercules, CA), and normalized to the control-treated group. In some experiments, cell proliferation was determined by an MTT assay.71 Briefly, ADPKD cells (4 × 103) were seeded into the wells of a 96-well plate (six wells per experimental condition) and grown under similar conditions as described above. After the 24-hour treatment, cell proliferation was measured using CellTiter 96 nonradioactive cell proliferation (MTT) assay (Promega, Madison, WI). ILK was knocked down in human ADPKD cells using an shRNA lentiviral approach. Six unique ILK shRNA constructs (RHS4531-EG3611), each with a high specificity for the ILK mRNA, and a scrambled nonsilencing shRNA construct (RHS4346) were purchased from GE Healthcare (Waukesha, WI). HEK293T cells were transfected with 4.5 µg ILK or scrambled shRNA plasmid DNA and the packaging vectors (4.5 µg psPAX2 and 1.8 µg pMD2.G) using Lipofectamine 200 (Invitrogen, Carlsbad, CA). The cells were incubated for 18 hours for lentivirus production. Fresh media was added, and the conditioned media containing the lentivirus was harvested at 24 and 48 hours. Human ADPKD cells were seeded into 100-mm petri dishes for 24 hours. Lentiviral harvest media from the two time points was added successively to the ADPKD cells. After viral infection, media bathing the ADPKD cells was switched to DME/F12+1% FBS for 2 days. Using immunoblot analysis, ILK knockdown efficiency was determined by band densitometry of ILK protein from ADPKD cells infected with ILK shRNA compared with the scrambled shRNA. We selected two shRNAs with the best knockdown efficiencies (mature antisense sequences for ILK shRNA1: 5′-ACACTACGGCTATTGAGTG-3′, and ILK shRNA2: 5′-ATACGGTTGAGATTCTGGC-3′). Alignment of the reverse complement of the antisense sequences targeted only ILK and no other mRNAs. To determine if ILK knockdown inhibits periostin-induced cell proliferation, ADPKD cells were infected with individual ILK shRNA or the scramble shRNA and then treated with 250 ng/ml periostin or EGF (positive control) for 24 hours. Cell proliferation was determined by either cell count (n=1) or MTT assay (n=3). Ilkfl/fl mice50 were crossed to mice expressing Pkhd1-Cre, which maximally express Cre recombinase in the CDs at PN day 751 to generate Ilkfl/+;Pkhd1-Cre mice. These mice were crossed to produce Ilk+/+;Pkhd1-Cre (WT: Ilk+/+ CD), Ilkfl/+;Pkhd1-Cre (Ilk+/− CD), and Ilkfl/fl;Pkhd1-Cre (Ilk−/− CD) mice. We observed normal Mendelian inheritance. Mice were provided food and water ad libitum and monitored daily. At 5 and 10 weeks of age, mice were water-restricted for 3 hours and urine was collected for measurement of osmolality using a vapor pressure osmometer. Afterward, the mice were euthanized in an isoflurane chamber, and blood was collected by cardiac puncture for measurement of BUN followed by exsanguination and removal of the kidneys, as described previously.20 The protocol for use of these mice was approved by the Institutional Animal Care and Use Committee at KUMC. To study the effect of ILK knockdown in PKD, we bred Pkd1fl/fl mice72 with Ilkfl/fl mice. Ilk fl/+;Pkd1fl/fl mice were crossed with Ilkfl/+;Pkd1fl/+;Pkhd1-Cre mice to generate litters of PKD mice (Pkd1fl/fl;Pkhd1-Cre) with Ilk+/+;Pkd1fl/fl;Pkhd1-Cre (Ilk+/+ PKD), Ilkfl/+;Pkd1fl/fl;Pkhd1-Cre (Ilk+/−PKD), and Ilkfl/fl;Pkd1fl/fl;Pkhd1-Cre (Ilk−/− PKD) ILK alleles in CD cells. Noncystic littermate controls (Ilk+/+ CD, Ilk+/− CD, Ilk−/− CD) were also generated using this breeding strategy. One group of mice was set aside for survival study where food and water were provided ad libitum and mice were monitored every day until death or euthanized when there were signs of imminent death, including labored breathing and inability to move.73 A second group of mice was assessed at PN day 25. These mice were anesthetized, and serum and tissues were harvested as described above, and euthanized by exsanguination. All mice were F3–F5 generations on the C57BL/6 background. To confirm the results in a slowly progressive model of PKD, we knocked down ILK expression in CDs of pcy/pcy (pcy) mice, a model orthologous to human nephronophthisis type 3 (NPHP3). 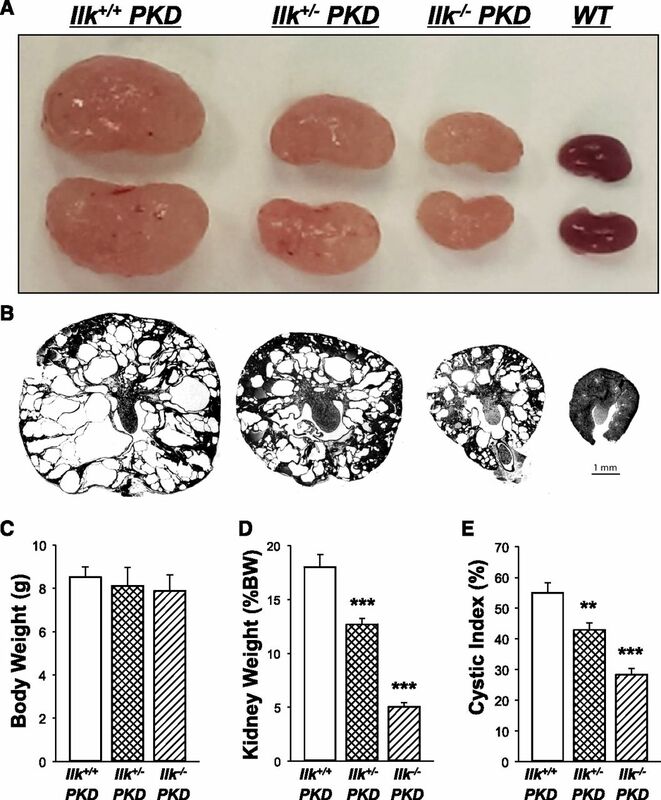 Disease progression in pcy mice is similar to ADPKD, with kidney enlargement to several times normal size and progressive interstitial fibrosis.74 Previously, we showed that kidney volume increased exponentially up to 20 weeks of age, after which there was a plateau as renal parenchyma was replaced with fibrosis.74 In general, these mice survive to approximately 40 weeks of age.20 Ilkfl/+ mice and Pkhd1-Cre mice were bred to pcy mice and backcrossed for eight generations. These mice were then bred to obtain Ilk+/+;pcy/pcy (Ilk+/+ pcy) and Ilkfl/+;Pkhd1-Cre;pcy/pcy (Ilk+/− pcy) mice. Because mice with complete loss of ILK died by 10 weeks, Ilk−/− pcy mice were not used. In one group, the mice were euthanized for tissue analysis at 10 weeks of age, as described above. Mice in the survival study had free access to food and water ad libitum. At 25 weeks, 50–100 μl of blood was collected from the tail vein for BUN analysis. These mice were monitored for survival as described above. We used a PCR method for genotyping ILK floxed mice. The forward primer sequence was 5′-GTTTCGCGGTGCTTCTGTG-3′, and the reverse sequence was 5′-AAAAGCCTTTGATCCTTGAATGG-3′. For genotyping WT and floxed Pkd1 alleles, the forward primer was 5′-CCTGCCTTGCTCTACTTTCC-3′, and the reverse primer was 5′-AGGGCTTTTCTTGCTGGTCT-3′. For genotyping for Cre alleles, the forward sequence was 5′-GCGGTCTGGCAGTAAAAACTATC-3′, and the reverse primer was 5′-GTGAAACAGCATTGCTGTCACTT-3′. ADPKD and NHK cells were seeded onto plastic petri dishes (100 mm diameter) containing DMEM/F12 medium with 1% FBS. Serum was reduced to 0.002% at 75% confluency. Cells were then treated as indicated and lysates were prepared in triton lysis buffer at specific time points. Lysates were also prepared from renal tissues as described previously.75 Total protein content was determined using BCA protein assay (Pierce, Rockford, IL) and 50 μg of protein was used for immunoblot analysis.71 The following antibodies were used: P-Akt (9271; Cell Signaling Technology, Beverly, MA [CS]), Akt (CS 9272), GAPDH (CS 2118), ILK (EP-1593Y; Origene, Rockville, MD), sc13075 (Santa Cruz, CA), P-S6K (CS 9234), and S6K (CS 9292). After incubation with an HRP-linked secondary antibody against rabbit or mouse (NA934, NA931; GE Healthcare), the blots were detected with ECL (RPN2232; GE Healthcare), imaged in AI 600 imager, and quantified with Biorad Quantity One program. Kidney cross-sections were fixed in 4% paraformaldehyde overnight, embedded into paraffin blocks, and 5 μm sections were placed on glass slides. Immunohistochemical staining for cleaved caspase-3 (CS 4858) was performed by the Department of Pathology and Laboratory Medicine core facility at KUMC. 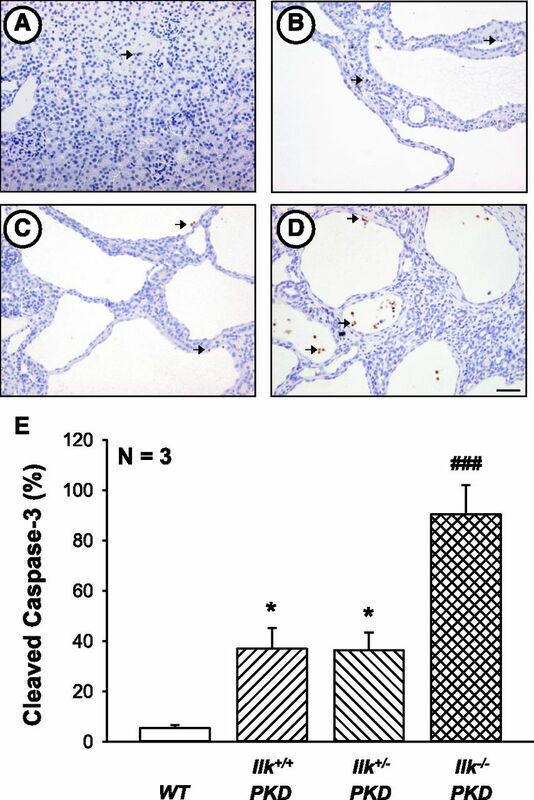 For quantification of cleaved caspase-3 staining, sections were blinded for the experimental condition, and the total number of cleaved caspase-3–stained cells was manually counted and normalized to the total noncystic surface area of the kidney (% cleaved caspase-3). For immunofluorescence, tissue slices were deparaffinized, rehydrated, and incubated with the following primary antibodies: Ki-67 (ab15880; Abcam [ab] Inc., Cambridge, MA) and Ki-67 blocking peptide (ab15881), ILK (EP-1593Y; Origene), and P-S6 (CS 4858), followed by incubation with fluorescent-conjugated secondary antibody (ab 150084). Sections were costained with FITC-conjugated DBA (FL-1031; Vector Laboratories, Burlingame, CA) to label CDs and mounted with DAPI (P36931; ThermoFisher Scientific). Slides were coded to conceal the group assignment and three nonoverlapping fields per section were imaged using a Nikon Eclipse Ti microscope (Nikon Instruments, Melville, NY). Quantification of nuclear Ki-67 and cytoplasmic P-S6 staining was performed with a multiwavelength cell-scoring application in Metamorph Image Analysis software (Molecular Devices, Sunnyvale, CA). Tissue sections were stained with Masson trichrome, causing collagen fibers to appear blue.20 Pkd1fl/fl;Pkhd1-Cre mice have aggressive disease, and die of massively enlarged kidneys before excessive collagen/ECM deposition. Accordingly, we observed only mild collagen deposition within the cortex, whereas there were dramatic prefibrotic edematous areas in the cortex and detectable fibrosis within the medulla. Tissues were scored by the naïve observer assigning a percentage of cortical area with prefibrotic edema and collagen deposition per total area of the cortex within the section. We also measured renal fibrosis in pcy mice which develop significant renal fibrosis by 10 weeks. Percentage fibrosis was scored on the basis of both prefibrotic and fibrotic areas. Serum was isolated from blood collected at the time of euthanasia by centrifugation at 10,000 rpm for 10 minutes. Urea concentration was estimated using a colorimetric QuantiChrom Urea assay kit (DIUR 500; Bioassay Systems, Hayward, CA) and BUN was calculated using the formula BUN=(Urea/2.14). Data are expressed as mean±SEM. Unless noted otherwise, statistical significance was determined by one-way ANOVA and Student–Newman–Keuls post-test for multiple comparisons or unpaired t test for comparison between control and treated groups. For survival studies, the Gehan–Breslow analysis was performed to determine statistical significance of the survival curves, and pairwise analysis was performed using the Bonferroni Method. Ilkfl/fl mice were provided by Dr. Udayan Apte at Kansas University Medical Center (KUMC), Pkd1fl/fl mice were purchased from Jackson Laboratory, and Pkhd1-Cre mice were received from the University of Texas Southwestern O’Brien Center Core (National Institutes of Health P30DK079328). Dr. Timothy Fields at KUMC provided advice on the pathologic examination of the tissue sections. We thank Marsha Danley for technical assistance with immunohistochemistry. This work was supported by a grant from the National Institutes of Diabetes and Digestive and Kidney Disease (R01DK081579 to D.P.W.) and a fellowship through the KUMC Biomedical Research Training Program (A.R.). Generation of primary cultures of autosomal dominant polycystic kidney disease and normal human kidney cells was supported by the PKD Biomaterials and Biomarkers Repository Core in the Kansas PKD Research and Translational Core Center (DK106912 to J.P.C.). Portions of this work were published previously in abstract form (J Am Soc Nephrol 25: 413A, 2014; J Am Soc Nephrol 26: 131A, 2015; and J Am Soc Nephrol 27: 773A, 2016). This article contains supplemental material online at http://jasn.asnjournals.org/lookup/suppl/doi:10.1681/ASN.2016111235/-/DCSupplemental.